In medium bowl, mix Gingerbread Bar ingredients until mixed well. Spread evenly in pan (mixture will be thick). Bake 20 to 23 minutes or until set and toothpick inserted in centre comes out clean. Cool completely, about 45 minutes. In large bowl, beat cream cheese and 1/3 cup softened butter with electric mixer on medium speed 1 to 2 minutes, scraping bowl occasionally, until smooth and creamy. Beat in vanilla and icing sugar until frosting is smooth and spreadable. 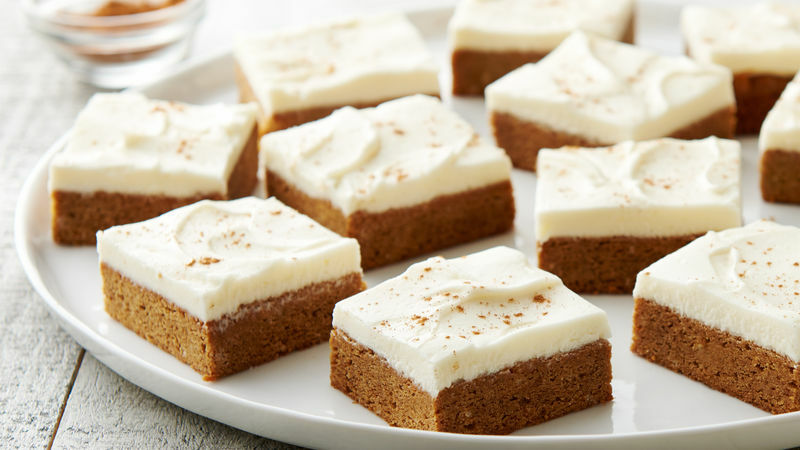 Spread frosting on top of cooled bars; sprinkle with 1/4 teaspoon cinnamon. Refrigerate 1 hour before serving. To serve, cut into 6 rows by 4 rows. The gingerbread mixture tends to be very thick and sticky. Using an offset metal spatula helps to distribute and spread mixture in pan. Store bars covered in refrigerator.